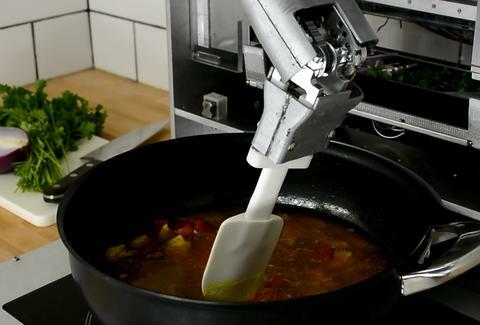 In yet another step towards Isaac Asimov's nightmares -- er, we mean the kitchen of the future -- the tech-savvy minds at Sereneti have unveiled a new robotic device that cooks entire meals. Dubbed Cooki, the machine does all the frying, stirring, and simmering for you, making it essentially a Keurig for busy or straight-up inept chefs. To get the process started, you first select a recipe from the compatible smartphone app. Then, you load up the gadget's trays with necessary ingredients (you can either prep the stuff yourself or order pre-cut, pre-washed portions from Sereneti) and snap them into the slots. Hit the start button on the app and Cooki is on the case. It'll go through the entire cooking process while you chill, notifying you that "food is ready" when it's done. Pretty sweet set-up, though as Gizmodo explains, the Cooki that Sereneti showed off at CES is still very much a prototype. They're currently raising funds on Indiegogo to work out the final kinks, and a $399 donation will secure you one of the first market-ready machines, estimated to roll out in October. So if you've got cash to spare and no patience for sauteing, go ahead and invest in this Jetsons-esque marvel. Kristin Hunt is a Food/Drink staff writer for Thrillist, and is already clearing space in her kitchen for Cooki. Follow her at @kristin_hunt.